Things I’ve Learned… and um… Re-Learned – Part 1 | Princess Inc.
« My Weight Loss Gadgets – A review! Keep it up! I started my “reinvention” around the first week of June. Today, after the elliptical workout I weighed in at 259… 18 pounds. I alternate workouts between my elliptical machine, free weights, and the swimming pool. The strategy is simple, burn more calories than you take in. Drink lots of water… Approx three liters per day for me. Keep moving, the Xbox kinect has some neat games that keep you moving while having fun at the same time. I had this problem too. Judging everybody else. I don’t know if you read the bible ever but Romans is a good book on this stuff. We have to remember that we don’t see the whole story. Maybe the skinny girl is throwing that stuff up when she gets home? Maybe she gets heart disease, diabetes, or cancer down the road. Everything eventually catches up with all of us. It is definitely something I am still working on but the best thing for us to do is to do the absolute best we can with ourselves and let everyone else make their own mistakes. Thanks for this perspective. I found myself saying — to myself, that I’d like to complete this journey without hating everyone. I’ve never been a judgmental person… Ever! But I find myself being super critical of myself and mentally chastising other people for their choices and decisions. Frankly, I’m not completely sure where it’s coming from. I agree that I don’t know any of their situations and I can’t start being dispassionate around things that I was so understanding about just 4 months ago. I’m guessing this is just a phase that I’m experiencing as I’m pulling back the layers of myself to reveal the true me. Thanks again for your comment, it really gives me a lot to think about. i can relate to this on so many levels. Like you, I too LOVE lists. Doesn’t give you like a sense of accomplishment or order? Sometimes I write down tasks i’ve already completed just so i can cross it off… but here i am rambling. lol. sorry. • Being stronger: putting yourself first is easier for some than it is for others. i’m glad that you’ve taken that step. It was a hard one for me. i have trouble saying no.. Also with this in powering through a workout, I find that intrinsic motivation is a strength. That moment where you want to give up, but you keep thinking of your goals. At least thats what kind of helps me when I’m ready to give up on the last 10 mins. • Bias: OMG! I find myself doing that same thing! Look I know I a card carrying member of the big girls club. It’s a work in progress. But when I see someone who is the same size if not bigger than me, in my head i’m chastising them. Like “you know you should not have ordered that. 15 WINGS? Really?!? That’s what you’re going to do?! ?” LOL. Your last line really resonates, When you said “that was me…and that could be me…” Truer words have never been spoken. • Instant Gratification: sooo ready for this healthier chick to unveil herself. • Gas? : Hmm. Haven’t come across that yet. But i have come across a frequency of BMs. Especially after ab exercises. Was that too much? Keep it up. I’m championing for you! Happy to be following your progress. I smiled when I read that you sometimes write things down so that you can cross it off! My employees make fun of my lists that I make weekly… I usually highlight things as I complete them, but it has the same effect lol. Thank you so much for sharing. Just yesterday I was asking myself what is different about my weight loss journey this time around. I kept coming up with two distinct differences and one being that I’m older and wiser but the other is blogging. Sharing my experiences and having support from people such as yourself has been the key to me keeping it up. Knowing that I’m not alone in the experiences that I’m having has been severely instrumental in keeping me motivated and strong and even STEADFAST in this movement that I’m making in my life. This time for me. You said that it’s hard for you to say “No” sometimes. I’m the same way. I love to help people and I’d literally give the shirt off of my back to help others. But in this journey, I’ve discovered that just as they say on an airplane that you have to put on your oxygen mask before helping others with theirs — I have to focus on me FIRST, before I can even begin to help others. For if I don’t take this step, I will not be around to even help anyone. This way of thinking is unnatural for me. But as I continue on, I’m seeing the positive difference I’m making in others lives. I now have employees that are choosing healthier eating habits. I have family members that are opting to exercise and paying closer attention to portions. By me helping myself first for a change, I’m inspiring others to take better care of themselves. This feeling greatly out weighs the discomfort of focusing on myself first. Thank you so much for taking the time to share with me your experiences. It really helps me along and helps keep me motivated. We can do this!!! One of my things is munching and portion control. Oy! 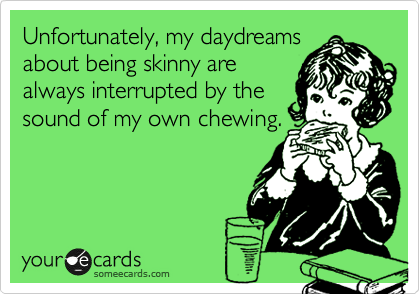 I’ve been trying to listen to my tummy, slow down when eating and trying not to eat mindlessly. I find that I’m satisfied at a little less or right at a typical portion size. That’s not the case with my new favorites like sweet potato chips lol. I’m getting there! Thanks for your response. Whoa whoa.. wait a moment…there are sweet potato chips? I must not look for these. HA! But to be serious, I find portion control difficult especially when eating out. My husband and I try to go to restaurants where portions are not family size for one person (we don’t eat at fast food places), but it can be difficult. Or if I’m hungry and just shove the food in my mouth without enjoying myself. I am learning not to do this, but I do have setbacks. Yes!!! You must try sweet potato chips! I enjoy them as a sweet and/or savory dish. I make them myself. I found quite a few recipes online. As for portion control. I FAILED at it when in restaurants when I first began my journey. I started weighing my foods just to give myself a clue on what portion sizes look like (there are guides that help you use your hands to determine proper portions as well). But when going out, I now ask for my doggy bag up front and I leave nothing but the portion size on my plate. When I’m saving money, my best friend and I choose items off of the menu that we both like and split it. It’s not a perfect science, but I do find myself in predicaments where I’m not safely in my kitchen preparing foods that I know are good for me. But I totally feel your pain. If you find any other good tips, let me know. This has always been a bear of a topic for me. My only tip so far is thus: Don’t go to restaurants that serve big food. In Seattle, this means spending more money on restaurants which highlight local organic and more upscale places. Of course, we don’t eat out as much but then it is a treat instead of ‘I’m too lazy to go to the grocery store and cook something fast at home so I’ll just order a pizza’ sort of gal. I have the same snacking problem too! I always feel like I need to constantly eat lol it gets really bad when I’m home alone! !